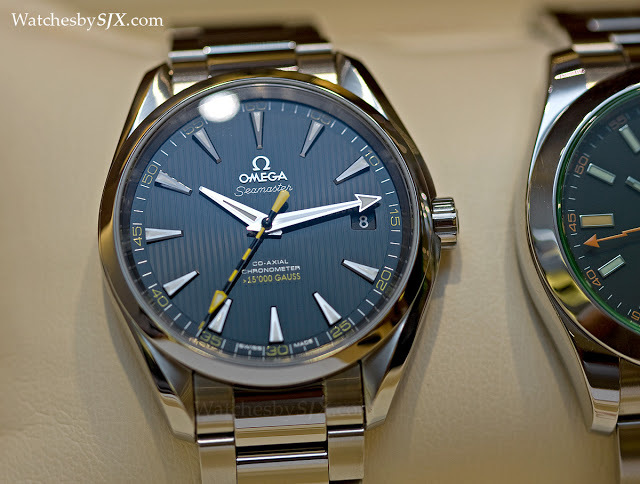 At Baselworld 2013 Omega unveiled the Seamaster Aqua Terra >15,000 Gauss, a landmark in magnetism resistant watchmaking. 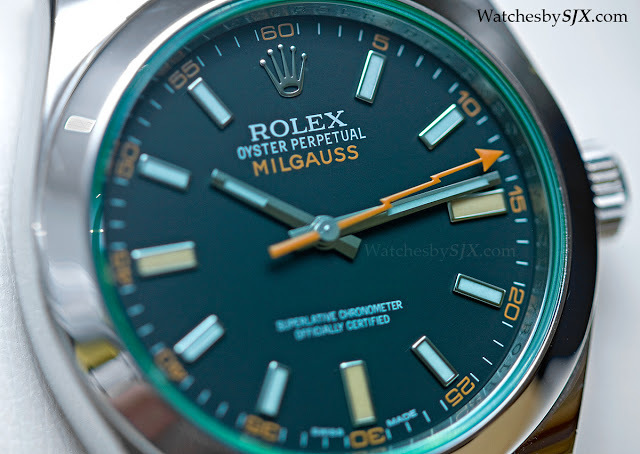 We see how it compares to the most famous antimagnetic watch of all, the Rolex Milgauss. Launched earlier this year at Baselworld, the Omega Seamaster Aqua Terra >15,000 Gauss is a breakthrough in the battle against the malign influence of magnetism in watches. Instead of using the traditional solution of a soft iron cage to insulate the movement against magnetism, Omega used non-magnetic materials for vital components of the movement, like the hairspring and escapement. 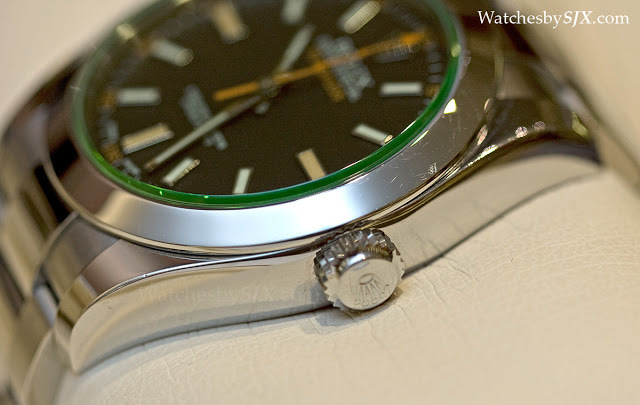 This pits the Omega against the Rolex Milgauss. 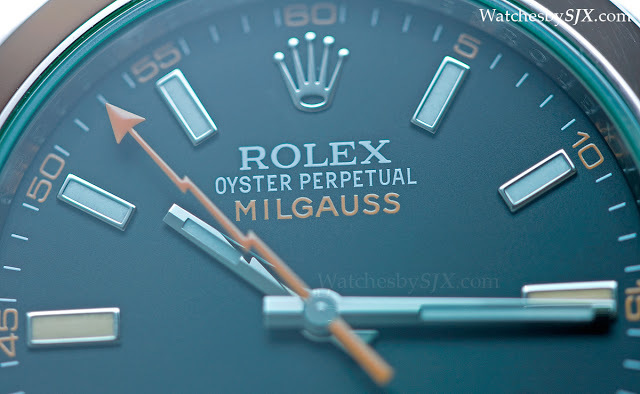 There are other antimagnetic watches available (IWC, Panerai and Seiko are notable candidates), each with their own merits, but the Milgauss is certainly the most well known. 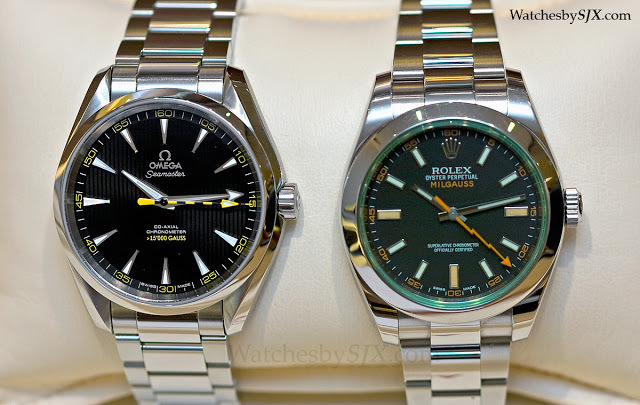 Here the Aqua Terra >15,000 Gauss goes head to head with the Rolex Milgauss 116400GV, fitted with the distinctive green tinted crystal. But note that the Omega is a brand piece sample from the boutique, while the Rolex has been worn often for several years. 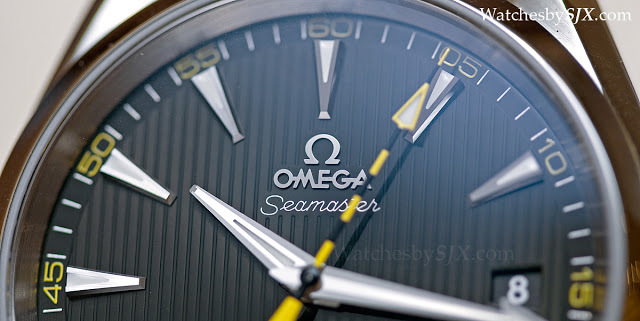 Technically, the Omega demonstrates significantly more innovation than the Rolex. It offers a comprehensive, though not new, solution to the issue of magnetism. The Rolex, on the other hand, sticks to the tried and tested solution of a soft iron cage. 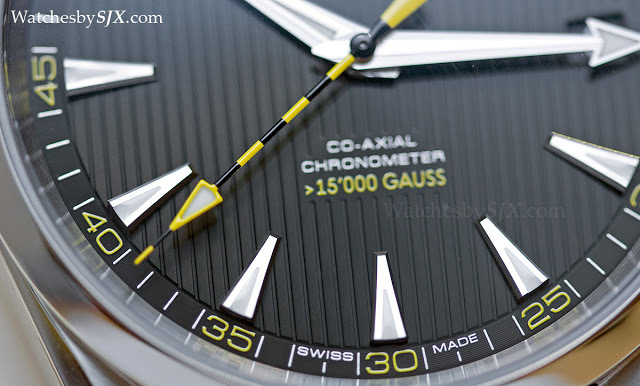 While the Omega is magnetism to over 15,000 Gauss, the Rolex clocks in at about 1000 Gauss (hence the name which is derived from the French phrase mille gauss, which translates as “thousand gauss”). 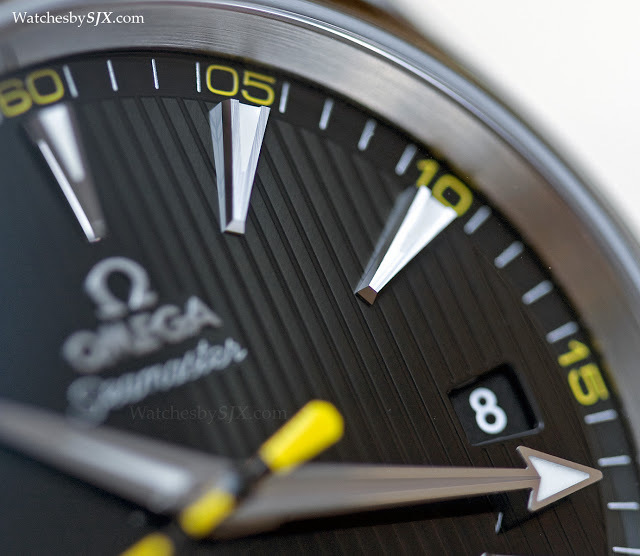 That is a reflection of the sophisticated engineering found in the Omega, but not significant in practice. That’s because the average person’s exposure to magnetic fields is negligible. According to the World Health Organisation, the household appliance with the greatest magnetic field strength is a hair dryer, and it amounts to about 20 Gauss at the upper limit. The Omega does have one major practical advantage over the Rolex, and that is the date window at three o’clock. 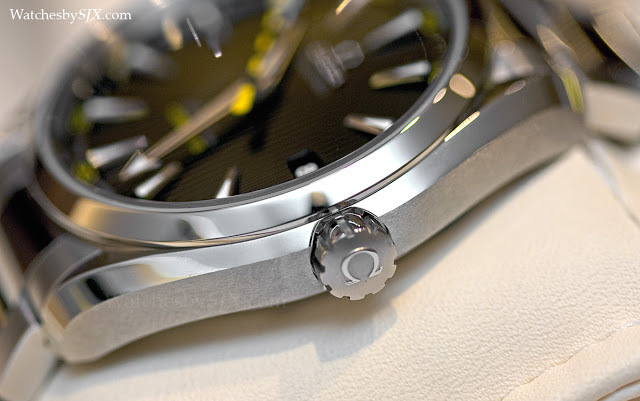 In terms of exterior fit and finish, the Omega has a superior case but the Rolex offers a far better bracelet. 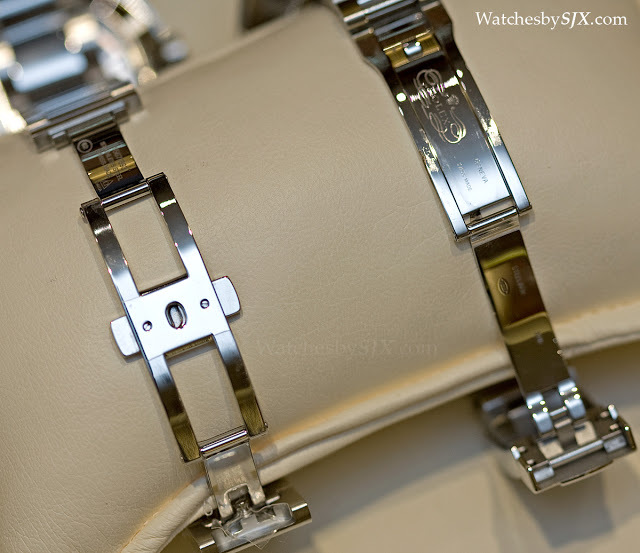 The Omega case has a more complex form with its curved lyre lugs, and also has both brushed and polished surfaces. 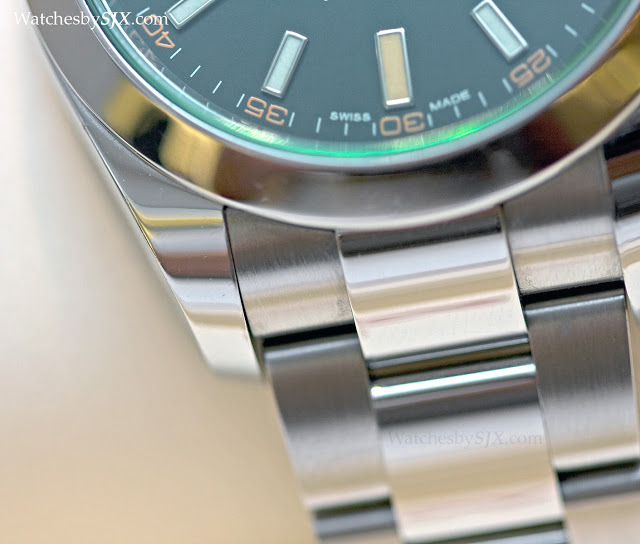 The Omega has brushed sides and lugs, with a broad polished bevel running the length of the case. 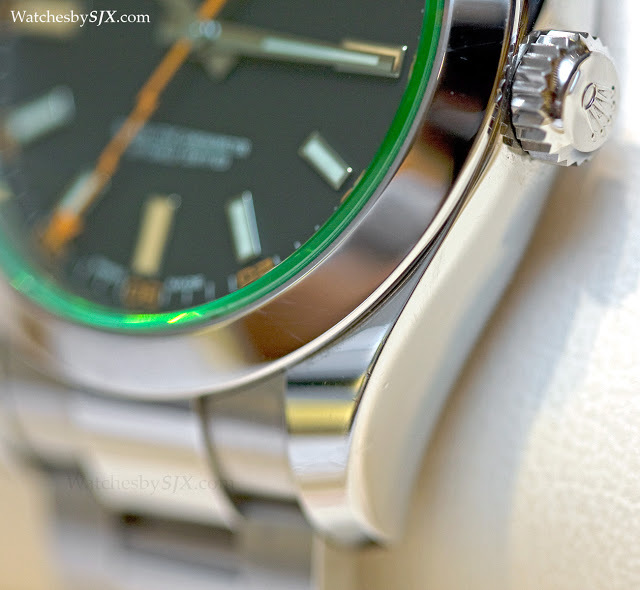 In contrast, the Rolex has a mirror polish throughout, albeit one that is beautifully applied. It is all rounded and smooth, almost pebble like. 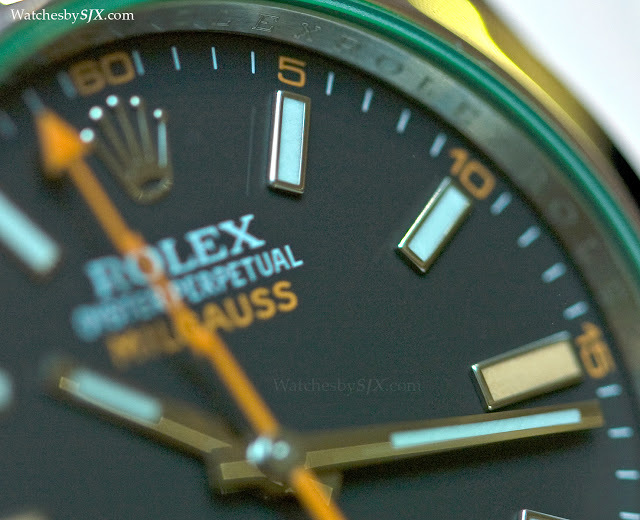 Notably the Rolex case will make it easier to refinish the case while retaining the original look and feel. 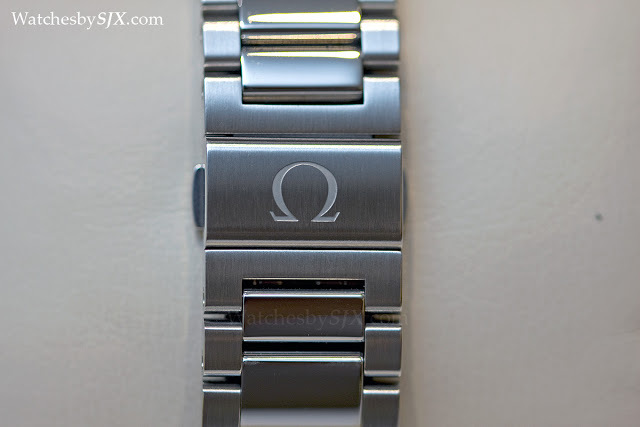 The Omega bracelet, however, is simplistic and its greatest let-down. 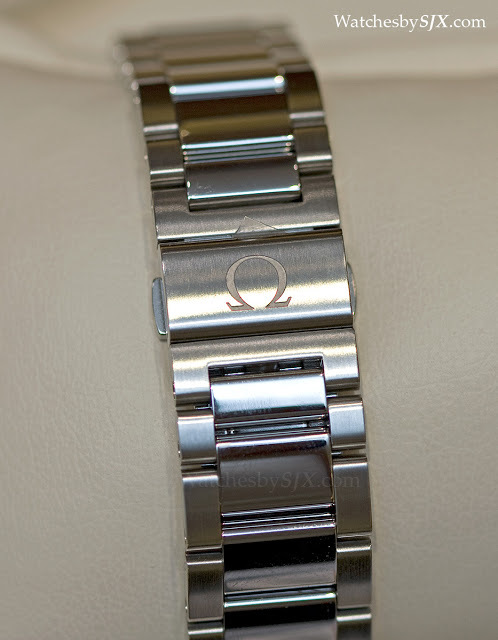 Embossed with the Omega logo, the clasp has a double fold deployant with two push buttons for unlocking it. The set-up works fine, but is not particularly compelling or solid. 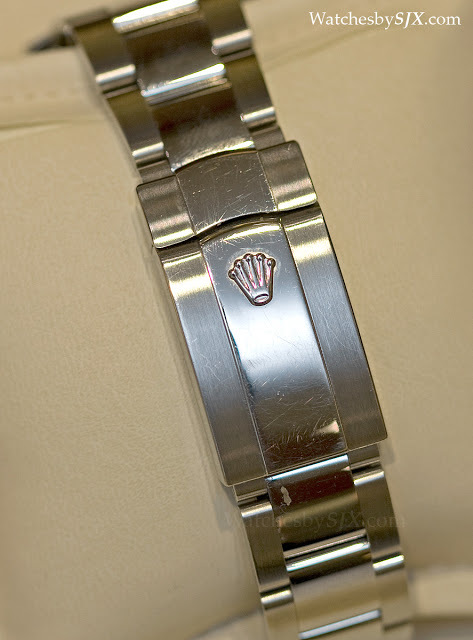 But the Rolex clasp, decorated with the five-pointed crown in relief, in particularly is a amazing piece of engineering. The buckle is spring-loaded and a joy to use. And the blades of the clasp are substantial. This gets top marks. Though the bracelet is not the most visible part of the overall watch, its weight and feel are important in lending the watch a sense of quality and heft. 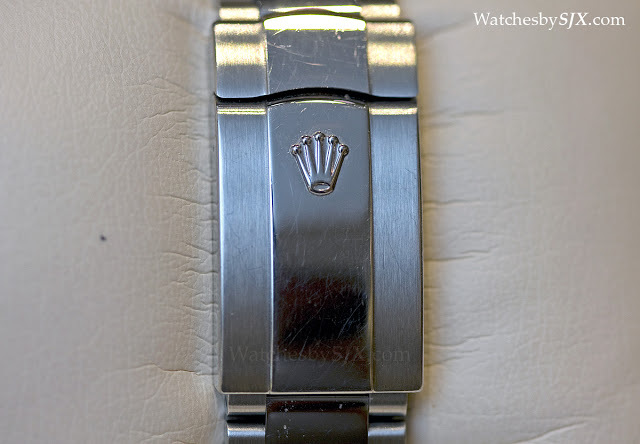 The Rolex bracelet accomplishes this brilliantly. In terms of dial and hands, both watches do very well. The printing on both dials is crisp and sharp. 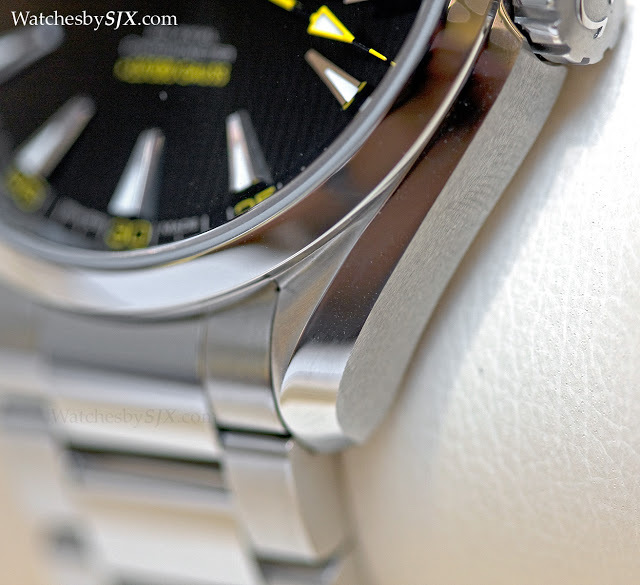 The Omega scores better in terms of the indices and hands, which are diamond cut, giving them razor sharp edges. This admirable detail is not apparent from a distance, but it gives the dial a greater feel of quality when examined up close. That being said, the yellow and black seconds hand of the Omega is not finished, with the uneven paint job visible on the underside of the hand. In terms of price, the Omega costs about a fifth less than the Rolex. 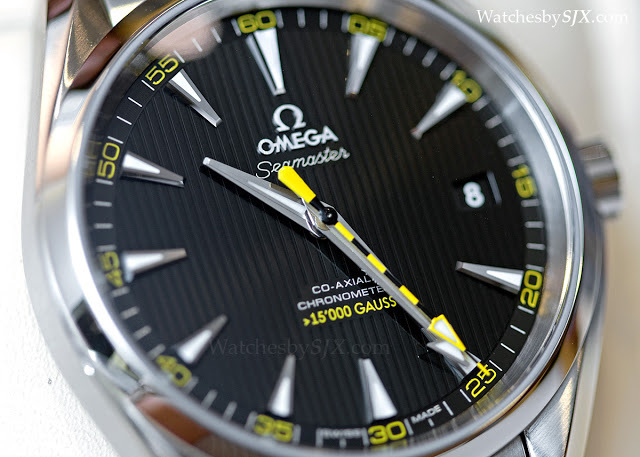 In Singapore, the Omega retails for S$8550 (~US$6800) including 7% tax. 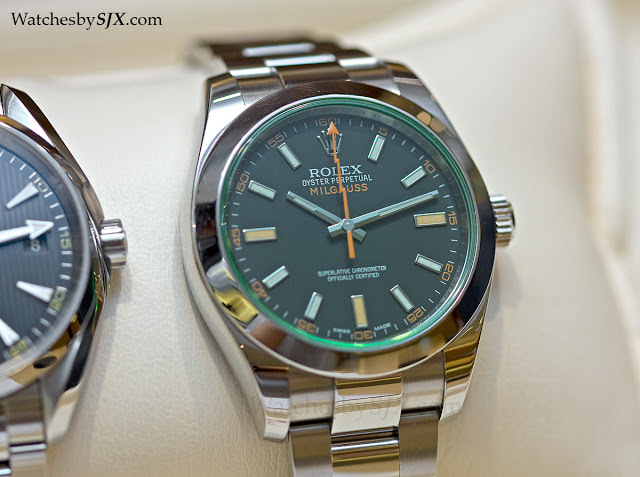 The Rolex Milgauss 116400GV retails for S$10,710 (~US$8550), while the version with a clear crystal (ref. 116400) retails for slightly less at S$10,020. While it is clear that the Omega is the better value proposition, it is not the unanimous winner because of its bracelet. 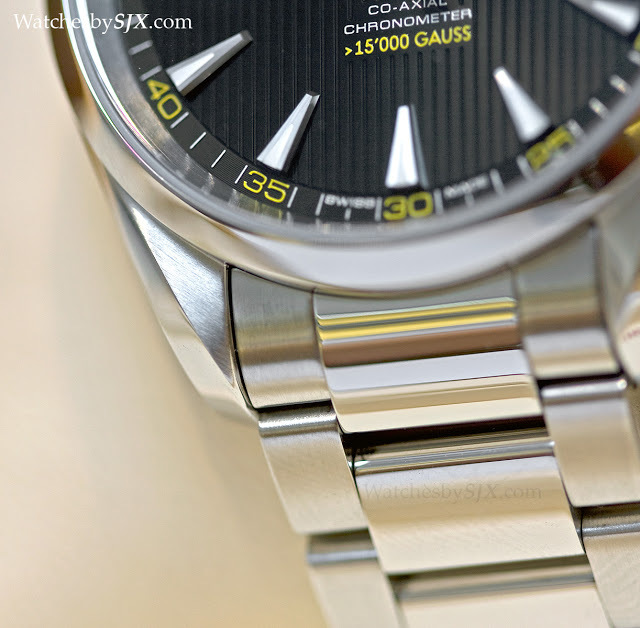 While the Rolex does not compare so well overall, its superb bracelet, seemingly a minor difference, gives it a stronger feel of quality – it feels like something expensive. So the Omega emerges victorious, but by a slim margin. – SJX Thanks to LZY for the loan of the Rolex.